yep. this is girly... and sweet. funny, all my neighbors go back and forth between here and florida or arizona. me? i NEVER wanted a 2d home. it's too hard taking care of 1!!! you go into their homes and talk about cold. NOTHING on the counters, no knick knacks, etc. plus every 6 months you have to reroute your mail and it takes a good 6 wks to get it all right anyway. sooooo, thanks but no thanks. anyway, if i EVER decide to travel to england, i can always drop in on you! A gorgeous girly card Anne-Marie. The image is just so sweet and your detailing is beautiful, I especially like the floral frame. HA! Definitely a lovely card with all kinds of scrumptious things that any girl would luv! 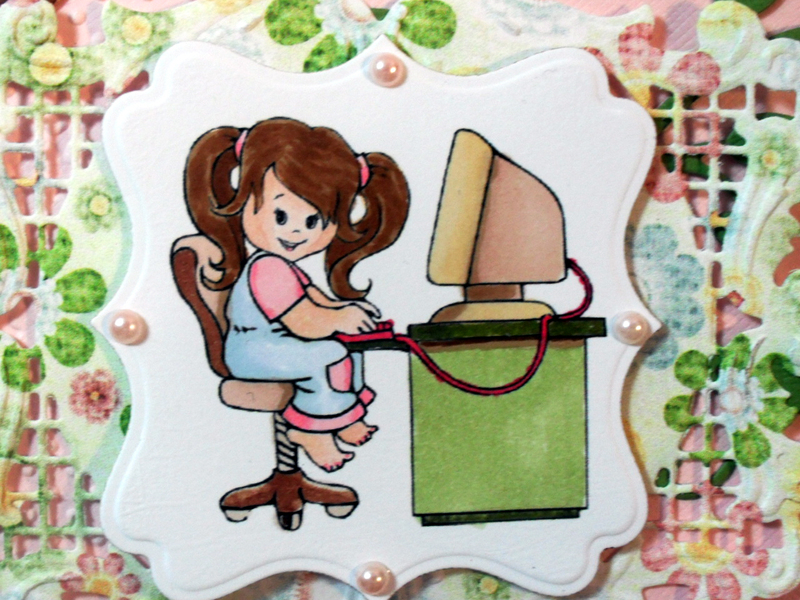 That little image reminds me of my sweet Claire who manages to commandeer my computer every time she comes over - humph! 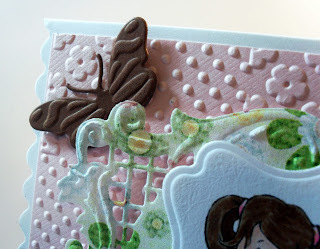 So like that embossing folder and the Marianne die -- very pretty, indeed! Oops, sorry, meant Joy Craft die. Anne Marie I just love the way you work with digital stamps. It's not one of my strong suits. I struggle with coloring which is why I have to have talented ladies like you on my DT to really showcase the sponsor's images. Everything on this card really flows together so nicely. Great job! Very pretty!!! Love the dies your used!!! This is a beautiful card Anne-Marie! I love that pretty lace, and that sweet image. Yay for surprise visits - lucky! I can't even get two kids to show up at the same time when I'm trying to coordinate it! 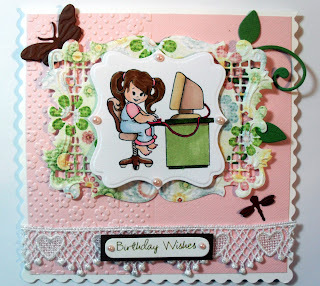 Gorgeous card hun, love the papers & colours you have used! This is so pretty!! Beautifully embellished!! I love that sweet image!! Aww, Anne-Marie, this is really sweet..i love the details and die and how you put it altogether! Beautiful Card. Thanks for joining in the Fab N Funky Challenges. 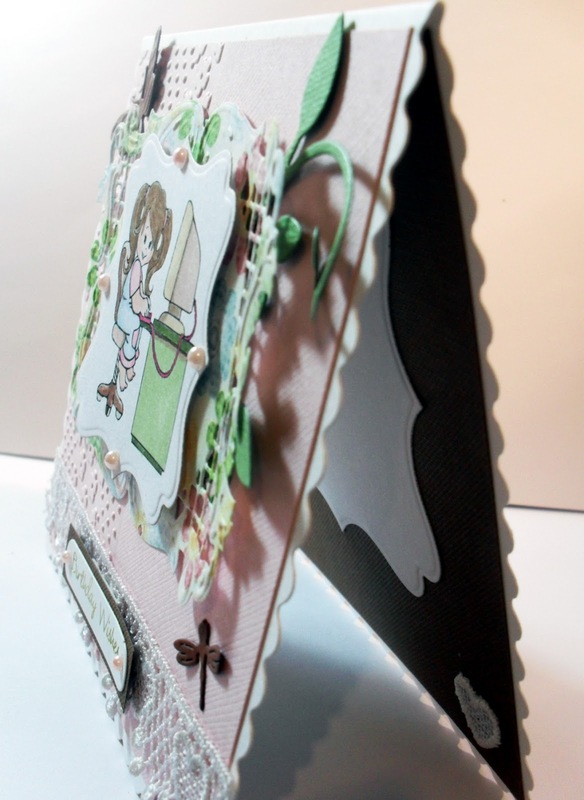 This is such a cute card and your use of punches/dies are fab! Great design and lovely details. 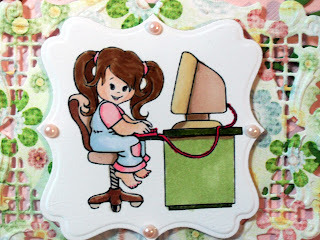 This girl is adorable, and I love the dies you used. Thank you for joining us at the Celebrate the Occasion challenge and hope to see you back again. Hiyah hunny!! I am so late on my bloggy wombles this week!! 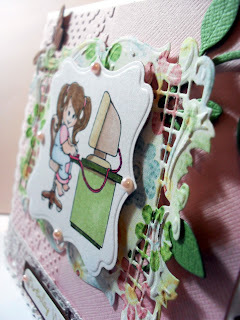 this is so cute, I love how you used patterned paper for the creatable die, it looks fab!! so gorgeous anne-marie.stunning sweet image and i love all your pretty details. Love the lace and dimension. Thanks for playing at Aud Sentiments, hope you have remembered to do the hop. Anne Marie, you did a fabulous job with this image. Your coloring is beautiful. Love the little added lace touch at the bottom and your pattern paper die is just the right compliment. What a sweet card!!! Thanks for participating in our Love To Create challenge!! Hope to see you again next week! This is such a sweet card! The image is pretty cute. 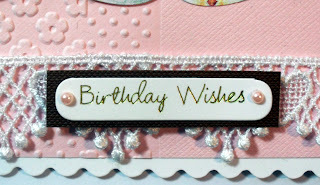 Love the colours and embossing too! I love all of the dainty and sweet pretties on this! Fantastic card! What a wonderful surprise for all of you! My sister and I live in different towns and work in different towns from where we live. About a week ago, I realized I was right behind her in the drive through of a local Dairy Queen at lunch time. We ended up parking our cars in the lot and eating lunch together. Love those spontaneous parties! Beautiful card - love the image and the die cut layers.